I am going to make a guess that Shelby like treats. Lip smacking, chop licking treats. 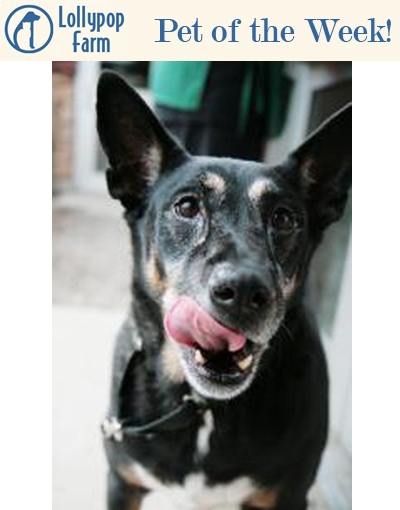 Shelby is a 9-year-old female German shepherd mix who weighs 73 pounds. She still has a lot of energy for her age, enjoys playing in the grass and is always eager to get outside. Shelby loves people, and will start to wag her tail as soon as she sees someone. She came to Lollypop Farm because she wasn’t getting along with another dog in the household. She will need to meet any dogs in the home before she goes home with an adopter, and might prefer to be the only dog. Children over the age of 12 are recommended. Shelby is eligible for our Seniors-for-Seniors program, so approved adopters 60 and older can take this wonderful girl home free of charge. Come to Lollypop Farm today to meet her! What a gorgeous senior girl! I love the older ones...anyone who discounts an adoptable dog simply because of age doesn't know what they are missing.